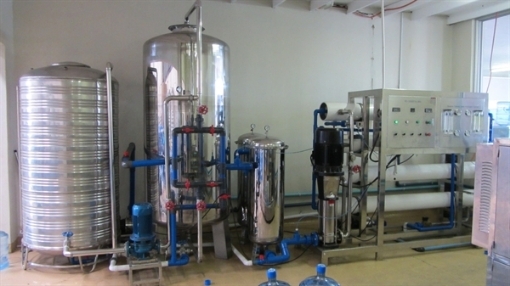 FilterShop.co.za Custom Water Systems | Reverse Osmosis | Water Filters. What System To Use? It can be very difficult to decide what the right solution is for a specific water source. We feel that it is better to design a custom system to address only the unique concerns in your water. If you can provide us with information about your source water such as a water analysis as well as what it will be used for and how much water you need to treat we can design a custom system to meet your needs. This approach normally saves a lot of unnecessary costs while ensuring that your concerns are addressed. We offer systems that are locally built where time is a concern, or imported systems for the most economical solution. First thing is to identify the possible problems that need to be addressed with your specific water; here are a few commonly found problems. This is a measure of how visibility dirty the water is, therefore if you have a turbidity of below 1 ntu you can use normal cartridge filters. If however you have a higher turbidity it will end up being very expensive as the cartridges will have to be replaced very often. In these situations we would recommend adding a Disc Filter before the cartridge filters since it is washable and thus only requires cleaning. If the turbidity gets over 10 ntu then a sedimentation and flocculation system will be required before a Disc Filter or Sand Filter. If you’re using river water as a source, ensure that you’re not drawing water from the bottom or surface as this would increase your turbidity. This is a complicated area as there are many variables. Most bacteria aren’t harmful but there are certain bacteria that you really don’t want in the water such as coli form and more importantly e-coli. It is important to have your source water tested for total hetrobolic plate count (THPC), coli form, and e-coli as these three tests will give a reasonable idea of what needs to be addressed. There are many ways to remove bacteria from water, but it is important to determine what would be the best way. With bacteria we always recommend that there are multiple barriers to bacteria to ensure that if one fails there is a backup. Ideally, you want a process that kills the bacteria followed by a process that physically removes the bacteria. There are also a few of the commonly used filters that very sensitive to bacteria in the water such as carbon filters, thus it is important to place a bacteria barrier before such filters. Please note, that all of the above is the same thing. This is a very common problem in our ground water. It is normally easy to see in kettles and geysers as a white build up, but it is also a problem when washing glass, dishes, or cars as the drop leave a white deposit as it dries. It is important to know the levels of hardness in order to choose the correct method of addressing the problem. There are a few ways to address the problem. Water Softeners are the best way to reduce hardness as it removes it at a low cost per volume while keeping its effectiveness high. Siliphos is another option that basically coats everything with a layer that prevents the hardness from depositing. This is a low cost option but it doesn’t actually remove anything and there are concerns about the long term consumption of the Siliphos. Large surface area sand filters are also an alternative as they provide a large surface area for the hardness to deposit. This is a lower cost option than a water softener but it isn’t as effective but in some cases it can be the recommended option. Reverse Osmosis or Nano Membrane Filtration are physical barrier filters that filter fine enough to remove hardness. This is however a very expensive process and as such doesn’t always make financial sense. This is typically seen in its oxidized form as rust and leaves a brown stain. Iron can be removed by oxidizing it with chlorine or ozone then removed by physical filtration or by special media that reacts with iron. It is important to test the levels of Iron present. This is water with a very high salt content and unfortunately the only practical way to address this is with Reverse Osmosis and it can get expensive if it is needed on a large scale. (This is why desalinating sea water is so expensive) It is very important to test the TDS or total mineral content as this will give you an indication of what will be required. (We sell small TDS tester it is not 100% accurate but it gives you a good indication) A standard under counter Reverse Osmosis (RO) unit is designed for a maximum TDS of 400 but in our experience tends to handle up to 700 without any modifications. If you are willing to sacrifice the life span of the RO membrane then you can run up to a TDS of 2000 through the normal membranes but expect a reduced life span and a best case product water of 50 TDS. If you have a TDS of over a 1000 then we would recommend Brackish water membranes that can handle up to 10000 TDS but at reduced lifespan and efficiency. Unfortunately these RO membranes are only available in the larger systems and not in the under counter units. If you have a TDS of over 10000 you need a small desalination plant and these are extremely expensive it is normally cheaper to look for a different water source. Ideally you would want to remove this from the house’s main water supply as chlorine is a known carcinogenic and doesn’t taste great. It is used to kill bacteria and prevent build up of bacteria in the distribution system, so it is a necessary evil. Fortunately it is easily removed with an in expensive Carbon Filter. We often recommend dosing chlorine when we design systems but we always recommend removing it before use. The owner of the lodge contacted us for a solution to his water problems. Once we received the water analysis it was apparent that it would be an interesting project as most of the problems you could have with water were all present in this one place. To make matters worse there was no alternative water source available. However since there was staff available to assemble everything on site we were able to save a lot of costs by only providing the individual components which was assembled on site. Chlorine dosing to kill bacteria and to oxidize the Iron. Due to the levels of bacteria, the chlorine levels had to be set very high. Storage tank to allow the chlorine to have a long contact time in order to kill the bacteria and oxidize the iron. As the iron oxidizes the molecules clump together. Sand filter to capture the oxidized iron and other large particles thus reducing the turbidity. 5um sediment filtration to remove all remaining visible particles. 0.2um sediment filters to act as a backup barrier to remove bacteria make this a double barrier system. From this point the water divides into two streams: Main supply and drinking water. The drinking water is then processed using a brackish water industrial Reverse Osmosis (RO) membrane. This is fed into a 70L pressure vessel that serves as a buffer for peak time water usage. The Tank then feeds an Ice Machine and several drinking water points. The main water supply side has a capacity 5000LPH and a drinking water capacity of 150LPH. Here is another example of a water source with a combination of problems. 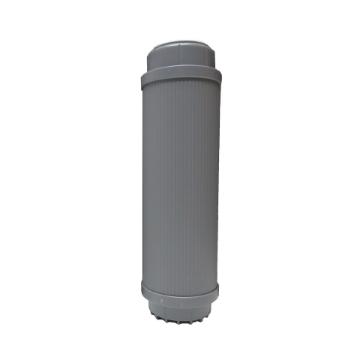 Disk Filter to lower turbidity and extend life span of sediment filter cartridges. Two Big Blue housings with 1um sediment filters in parallel to block bacteria and sediment from entering the system. This provides a flow of 5000LPH. Two Big Blue housings with Activated Carbon filters in parallel to catch any hydro carbons and oxidizing agents that might damage the RO membranes. Water Softener to remove the kalk, Lime, Hardness from the water. This is followed by another set of 1um filters to ensure that no particles from the carbon filters or the water softener get to the RO membranes. Reverse Osmosis (RO) is then used to remove the salt from the water and to remove any remaining bacteria. The product water is then stores in tanks that control the rest of the plant via a level switch. Pressure pump to supply the water from the tank to the building. The estate also has the problem that the only available water source is not fit for human consumption. We offered two options, the first is chlorine dosing at a central point and then individual treatment at each house thus moving the cost to the home owners and the second option was a large central treatment plant that would supply all of the houses in the estate. The Proposed setup would require large reservoirs, one as the source water for the RO plant and the other as the product water which will then be supplied to the households. The reservoirs would give you a day and half worth of product water, if the RO plant is down for maintenance. The running of the RO plant would be controlled by level switches and so will be automated for the most part, however keep in mind that the plant will need to be constantly monitored and maintained. The disc filters will remove large dirt, sand, mud, rust and other large visible particles in the water. The disc filter’s cartridges are reusable and when they become blocked you simply open the housings, remove the cartridges, wash them with a hose and then replace them. The disc filters would be installed between the borehole and the source water Reservoir, with the 6 disc filter units we would recommend that they be placed on a stand in a 3 by 3 formation. This will result in three of the disc filters being in use and three of the disc filters on standby. Having three of the disc filter units in parallel will divide the flow rate between the three disc filters, also by having two sets means that you will not have to shut down the complete system for cleaning the disc filter. You will simply divert the flow from the disc filters in use to the disc filters on standby, then clean the disc filters while the plant continues to run. With the high bacteria levels in the water, we dose the source water reservoir tank with chlorine. The chlorine will help to significantly reduce the bacteria levels as well as prevent the bacteria from multiplying inside of the reservoir. The Activated carbon vessel will remove the remaining chlorine and organic molecules from the water. The Reverse Osmosis (RO) membranes are very sensitive to chlorine, which is why it is important to remove the chlorine before it reaches the membranes. The removal of organic molecules will help to reduce bad odours in the water. The hardness in the source water is quite high, and will adversely affect the life span of the RO membranes, so to remove the hardness a water softener is used. The first rounder will contain 5 Micron sediment filter which remove any remain visible particles that may have gotten through the disc filter, as well as remove any loose carbon dust or resin coming from the units before. The second rounder will contain 1 micron sediment filters, which will remove even finer particles as well as help to capture some of the bacteria from the water. The RO membranes are the heart of the plant, and will remove 98.9% of the remaining contaminants in the water including heavy metals, pesticides, herbicides, viruses, remaining bacteria and they will bring down the salt content of the water significantly. The final stage of the process is a chlorine dosing system between the RO membranes and the product water reservoir. Now that the water has been cleaned, it is important to prevent bacteria from re-multiplying in the product water before it is used. We hope that this has given you a better understanding of water treatment and the process if addressing specific concern. Please contact us and give us the opportunity to put our experience with thousands of clients to work on addressing any water related problems that you might have.